Ann was inspired to develop this movement after watching many people, over many years try to get down onto the floor and back up again. This technique promotes conscious movement that combines gravity, technique and intention that the body ‘learns’ with very little practice. 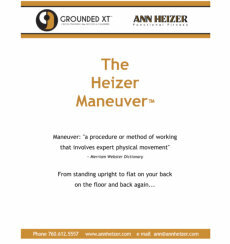 The Heizer Maneuver™ enlists physics and gravity to work for you rather than against you. You are empowered to feel graceful, powerful and elegant. Any reluctance to get down onto the floor is overcome by knowing the way back up. This opens up a world of Grounded XT™ exercises that can be done on the floor. Hooray! I've fallen and I CAN get up!